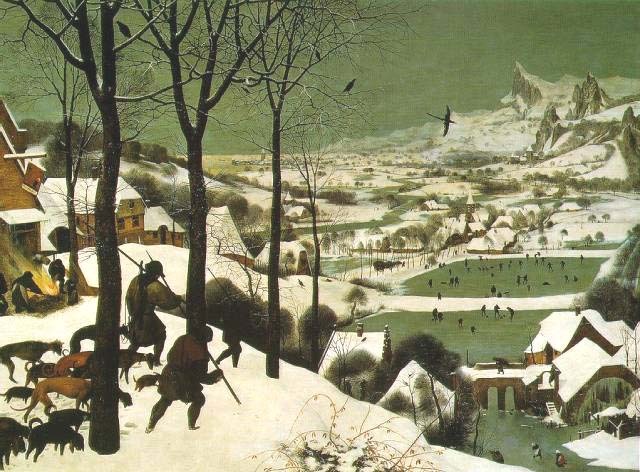 Paintings by Pieter Breughel the elder are often used to illustrate the Little Ice Age, such as this winter scene from his series on the seasons. Below is a description of the period. THE YEAR WAS 1645, and the glaciers in the Alps were on the move. In Chamonix at the foot of Mont Blanc, people watched in fear as the Mer de Glace (Sea of Ice) glacier advanced. In earlier years, they had seen the slowly flowing ice engulf farms and crush entire villages. They turned to the Bishop of Geneva for help, and he made the journey to Chamonix. At the ice front he performed a rite of exorcism. Little by little, the glacier receded. But before long the threatening ice returned, and once again the bishop was summoned. The struggle against the glacier continued for decades. Similar dramas unfolded throughout the Alps and Scandinavia during the late 1600s and early 1700s, as many glaciers grew farther down mountain slopes and valleys than they had in thousands of years. Sea ice choked much of the North Atlantic, causing havoc with fisheries in Iceland and Scandinavia. Eskimos paddled their kayaks as far south as Scotland. At the same time in China, severe winters in Jiang-Xi province killed the last of the orange groves that had thrived there for centuries. These and many similar events, bewildering and disruptive to the societies of the time, are pieces of a global climatic puzzle that scientists and historians today call the "Little Ice Age." Throughout the world, from Norway to New Zealand, glaciers in mountainous areas advanced. Elsewhere, particularly in parts of Europe and North America, temperatures plummeted and harsh weather set in. It was a time of repeated famine and cultural dislocation, as many people fled regions that had become hostile even to subsistence agriculture. Experts disagree on the duration of the Little Ice Age. Some mark its inception as early as the 1200s, others view the Little Ice Age "proper" as beginning around 1450 or even later. Disagreements arise because the phenomenon was not simply a giant cold snap. The cooling trend began at different times in different parts of the world and often was interrupted by periods of relative warmth. All agree, however, that it lasted for centuries, and that the world began emerging from its grip between 1850 and 1900. Most of the Little Ice Age occurred well before the Industrial Revolution and the widespread burning of fossil fuels, so scientists are confident that its climatic convulsions had purely natural causes. The event fascinates scientists because it gives them a glimpse of how Earth's climate system operates when left to its own devices. "It's important because we're trying to understand the warming over the past 100 years," says Alan Robock of the University of Maryland's Department of Meteorology. "Some people have said it's just a `recovery from the Little Ice Age.' Well, what does that mean?" In the 10,000 years since the end of the last major ice age, which closed the Pleistocene Epoch, Earth's climate has undergone a series of global warmings and global coolings. Though far smaller than the temperature swings of the Pleistocene, during which vast ice sheets expanded over large parts of continents and melted away several times, these oscillations nonetheless left their marks on human cultures and natural ecosystems. With each climate change, whether global or local, ecological communities shifted north or south or were disrupted, leading to the creation of new groupings of species. Likewise, human cultures were uprooted and driven to more favorable locales, or people adapted by changing their technologies and behaviors. About 6,000 years ago, for example, during a period known as the "Holocene Maximum," global temperatures were about 2 degrees Fahrenheit warmer than today. Rainfall patterns also were different. For example, in what is now the arid core of the Sahara desert, hippopotamuses and crocodiles thrived in lakes and swamps. Moister conditions in Mesopotamia and the Indus Valley aided the development of agriculture and humanity's first great civilizations in these regions. Then global cooling dropped the temperatures to a little cooler than they are now, and living things shifted again. Earth didn't warm appreciably until about 2,000 years ago. During the present millennium there was a period of relatively mild climate called the Medieval Warm Period, lasting from about 1000 to 1300 AD. As with the Little Ice Age, its timing and effects varied from region to region, and many experts doubt that the Medieval Warm Period was a truly global phenomenon. In East Asia, for example, temperatures were cooler. Europe, though, enjoyed an undeniably balmy climate during the early medieval period. Agriculture flourished farther north and at higher elevations on mountains than is possible even in today's warmish climate, and harvests generally were good. Farmers raised wine grapes in England 300 miles north of present limits, and in what now are icebound parts of Greenland, Norse settlers grazed sheep and dairy cattle. In his book Climate History and Modern Man, H.H. Lamb noted that the great burst of cathedral-building and population expansion in medieval Europe coincided with the peak of the Medieval Warm Period. By about 1400, the climate had cooled to temperatures comparable to today. Over the next century or two, the world would cool still further, bringing on the Little Ice Age. Unlike many earlier climate swings, the Little Ice Age was abundantly documented by human observers. Records include the first readings from meteorological instruments such as rain gauges and thermometers. Galileo invented the thermometer in the midst of the ice age, and in central England, reliable, monthly temperature records begin in 1659. For most places, however, and for times before the 1600s, it takes some sleuthing to deduce past weather conditions. Climate historians search old journals and public documents for descriptions of events such as snowstorms, frosts and droughts at unusual times of year. The prices of wheat and other grains in a given year sometimes are used to estimate the size of the harvest and, by another step in logic, the favorableness of the weather that year. One researcher even made a statistical study of the skies depicted in landscape paintings to trace the changes in cloudiness from the 1500s to the present. Where human records are absent or unreliable, researchers turn to a host of natural climate indicators. Foremost among these are tree rings, which are formed by the annual growth of wood in the trunk. During warm years, trees grow fast, adding thick rings; during cool years, rings are thin. After correcting for idiosyncrasies of tree growth, a tree-ring researcher can use the pattern of thick and thin rings to reconstruct the temperatures during the tree's lifetime. Researchers also drill into glacial ice at the poles and on high mountains to obtain records of snowfall, dust and atmospheric chemicals contained in the ice. These can give information on temperature, precipitation and even global wind patterns, if the source of the dust can be determined. Layers within lake sediments, coral reefs and cave formations can be analyzed by sophisticated chemical techniques to determine the temperatures at which they formed. From all these data sources, climate researchers have assembled a broad picture of a world that was, on average, one to two degrees cooler than it is today. For comparison, during the Pleistocene, when the ice cap in eastern North America reached as far south as Pennsylvania, the world was about nine degrees cooler. Averages, however do not tell the story. The effects of the Little Ice Age were anything but uniform. Cooling was much more pronounced (or at least better documented) in the Northern Hemisphere than in the Southern Hemisphere. In some places and some years, winter temperatures were colder, but not summer temperatures. In France, for example, the harsh winter of 1788-89 added to the misery and discontent of the peasants, but Paris warmed up pleasantly in time for the storming of the Bastille that summer. Cold and erratic weather patterns produced numerous crop failures in northerly areas such as Scotland and Norway. Native American tribes such as the Iroquois relocated their villages to escape the cold. These migrations stirred up political conflict among tribes, leading to the creation of nonaggression pacts like the famous League of the Iroquois, adopted in the 1500s. Perhaps hardest hit were the Norse settlements in Iceland and Greenland. The population of famine-ridden Iceland dwindled during the Little Ice Age to half its previous numbers. Greenlanders fared even worse. Growing sea ice cut off communication with the outside world beginning about 1370, and when German ships landed in Greenland more than a century later, they found a single frozen corpse but no living colonists among the ruins. Despite all the hardships, there was a lighter side to the Little Ice Age. In London, freezings of the Thames River were celebrated with carnival-like "Frost Fairs" with food, drink and entertainment on the ice. The cold, snowy winters of the early 1800s may have inspired Charles Dickens' sentimental vision of the "old-fashioned" white Christmas. In the fledgling United States, New York harbor froze over in winter, allowing people to walk from Manhattan to Staten Island. So, what caused the Little Ice Age? Because the sun is the ultimate source of Earth's warmth, some researchers have looked to it for an answer. In the 1970s, solar researcher John Eddy, now at Saginaw Valley State University in Michigan, noticed the correlation of sunspot numbers with major ups and downs in Earth's climate. For example, he found that a period of low activity from 1645 to 1715, called the Maunder Minimum, matched perfectly one of the coldest spells of the Little Ice Age. Judith Lean, a solar physicist at the Naval Research Laboratory in Washington, estimates that the sun may have been about a quarter of 1 percent dimmer during the Maunder Minimum. This may not sound like much, but the sun's energy output is so immense that 0.25 percent amount to a lot of missing sunshine -- enough to cause most of the temperature drop, she says. Other researchers have examined earthly causes. Volcanic eruptions are known to meddle with climate by injecting a veil of sun-blocking aerosols into the atmosphere -- the so-called parasol effect. Remember Mount Pinatubo? Its eruption in 1991 dropped Earth's average air temperature by about 1 degree -- an effect that lasted about two years. The University of Maryland's Robock points out that there were more frequent eruptions during the Little Ice Age than during the 20th century. Most prominent was the 1815 eruption of Tambora in Indonesia. It pumped into the atmosphere vast amounts of ash -- ten times that of Krakatoa, another famous Indonesian volcano. The following year has been called the "Year Without a Summer." In June and July of 1816, New England and northern Europe suffered frost and even snow. Scientists dispute the importance of these two causes, and of other possibilities such as shifts in ocean currents. But it seems possible that during the Little Ice Age Earth's climate was hit by a one-two punch from a dimmer sun and a dustier atmosphere. What about the greenhouse gases -- mainly carbon dioxide and methane -- that have been so much in the news lately? These heat-trapping gases have been important players in the climate system since our planet's beginnings, but their natural variations in recent centuries have been too tiny to have had much impact. That, however, may be changing. Greenhouse gases in the atmosphere have been increasing steadily on account of the burning of fossil fuels and other human activities. Lean, at the Naval Research Lab, says that while changes in solar output and volcanic dust seem to have driven the fluctuations of the past, this century's rise in temperature may have been influenced by humans. The amount of influence, however, remains in dispute. Carbon dioxide concentrations have increased by about 28 percent since pre-industrial times and are growing at the rate of 0.4 percent per year. There is no dispute about this. There is, however, disagreement about whether the increase is warming the climate and by how much. "We're lucky to have the phenomenon of the Little Ice Age," says climatologist Jonathan Overpeck of the National Oceanic and Atmospheric Administration in Boulder, Colo. Earlier periods of climate change are not nearly so accessible for study. "By studying the last several centuries we should really be able to narrow down the uncertainty with regard to what's going to happen next year or 50 years from now." One thing that happened during the Little Ice Age was that it spoiled the 1816 summer vacation of poet Percy Bysshe Shelley and his wife, Mary, with friends at Lake Geneva in Switzerland. The weather was so cold that they stayed indoors much of the time, entertaining one another with horror stories. Mary Shelley's contribution was Frankenstein, the immortal fable of human tampering with the forces of nature. In Shelley's tale, a legacy of the Little Ice Age, the monster and his creator meet their fates in a frozen Arctic sea. Today she might have chosen a parched greenhouse desert. Science fiction aside, the clear message of science and history is that climate change has always been a natural phenomenon on Earth and a matter of vital human interest. Alan Cutler is a visiting scientist at the National Museum of Natural History.